Below are more detailed reviews of the best ear cleaners for dogs. There are plenty of dog ear cleaner options on the market today. But, as a pet owner, you want to use only the best product on your pet. The two most common options include liquid solutions and ear wipes. Liquid solutions typically work the best. However, wipes also get the job done. Here are the top 5 ear cleaner solutions for your dog that you can count on. Dogs ears are prone to infection and irritation. However, with Zymox Ear Cleaner, your dog’s ear health will remain at optimal levels. This ear cleaner is non-toxic and is a very mild solution. The ingredients are all natural and are unlikely to cause irritation. The ear cleaner uses enzymes to ensure the health of your dog’s ears. With constant use, your dog’s ears will remain soothed and clean. You can’t go wrong with this quality ear cleaner! 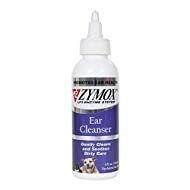 We give Zymox Ear Cleaner for Dogs our exclusive FIVE STAR rating! Tea tree oil is a prized ingredient in human health and skincare. NaturVet Ear Wash with Tea Tree Oil uses all natural ingredients. While the solution is gentle, it is very effective. This dog ear cleaner can be used to clean the ear canal by dissolving ear wax. The wash can also remove any foreign debris in the ear. The solution can be purchased in baby powder and aloe scents for a soothing effect. We give NaturVet Ear Wash with Tea Tree Oil for Dogs our exclusive FIVE STAR rating! 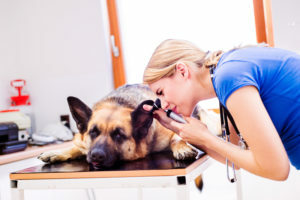 What is better than a dog ear cleaner created by a veterinarian? You can rest assured that this solution is high-quality! This ear cleaner is used to clean, dry and deodorize your dog’s ears. The solution is antibacterial and uses soothing ingredients such as aloe vera. It can also be used to heal the ear after an infection. The cleaner is gentle and can be used as often as needed. 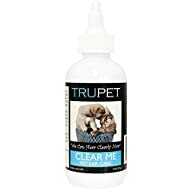 We give TruDog Clear Me Cat & Dog Ear Cleaner our exclusive FOUR STAR rating. This ear cleaning solution is said to create the perfect environment for healthy ears. 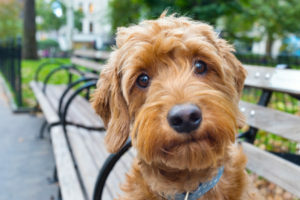 The formula is meant to clean and deodorize your dog’s ears. The solution also acidifies the ear canal. This helps to prevent wax and bacteria build-up. Active ingredients include water, aloe vera, lactic acid, glycerin, and propylene glycol. 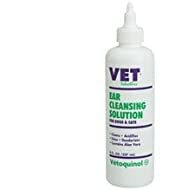 We give Vetoquinol Ear Cleansing Solution our exclusive THREE STAR rating. This is a high-quality routine ear cleaner for your dog. The mild solution is alcohol-free and helps to prevent ear infections. To keep bacterial infections away, this solution uses salicylic acid. This ingredient is known for its anti-adhesive properties. It helps keep bacteria from attaching to the inside of the ear. Epi-Otic uses a neutral pH to keep your dog’s ears clean and healthy. We give Virbic Epi-Otic Advanced Ear Cleaner for Dogs our exclusive FIVE STAR rating! Your dog’s ears are the prime location for all sorts of yucky things. Ears are dark, deep, and moist. This makes them the ideal breeding ground for all sorts of germs and bacteria. If any of these items sit in the ear for too long, they can cause an infection. So check your dog’s ears and check them often! 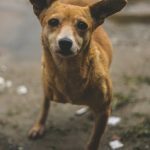 Is your dog constantly scratching at his ears? Does your dog shake his head a lot? Do your dog’s ears smell a bit off? If so, odds are those ears need time with a good ear cleaner! Keep reading to learn more in-depth ear cleaning information. Cleaning your dog’s ears should start during puppyhood. The more often you clean your dog’s ears, the less complicated the process will be. When cleaning your dog’s ears, it’s important to be gentle. Never use a q-tip to clean the ears. Instead, a cotton ball soaked in a dog ear cleaner solution is best. Gently use the cotton ball to remove any debris in and around the ear. If possible, clean your dog’s ears at least once a week. Clean ears mean healthy ears! 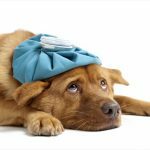 If any of these symptoms persist, it’s time to see a vet! Untreated ear infections can be serious, including the risk of deafness. 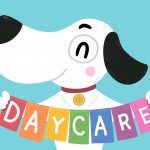 Ear health matters! 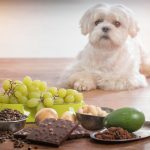 An important part of keeping your dog healthy is using vitamins and supplements. However, these items aren’t inexpensive. 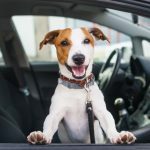 If you want to take the best care of your dog without breaking the bank, we can help! Top Dog Vitamins provides reviews on some of the most popular dog vitamins and supplements. From probiotics to multi-vitamins, we cover them all!